The game was originally started in West Somerset by Tom Lomas from the Notley Arms in Monksilver in 2001. 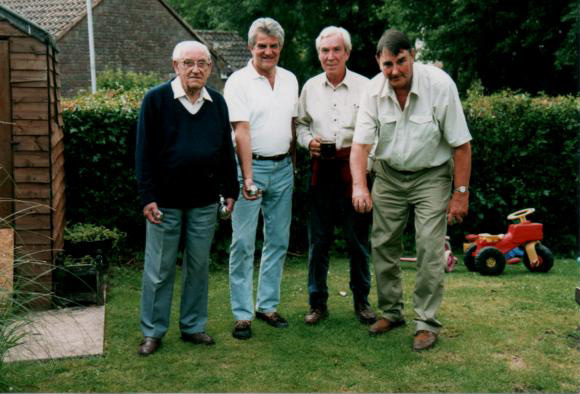 He persuaded 3 of his friends to join him and play on the lawn, these being Mike Browning, Fred Sheppard and David Henderson. They called themselves the Silver Monks and were quickly joined by the Carew Arms in Crowcombe. In 2002 the Masons Arms in Williton joined, and 2 weeks later The Windmill Inn in West Quantoxhead came along. From these 4 teams the West Somerset Boules Association was formed as a social gathering and an excuse to visit different pubs in the area, also from these 4 teams popularity grew in West Somerset until today we have 20 teams and 3 leagues. We get a chance to visit all the pubs in the area, and are grateful to the Landlords for their support as without them the teams would not exist. Tom Lomas was Chairman of the Association until 2011 and is still Captain of the Silver Monks.